Grimm Brothers' The Ditmars Tale of Wonders, first version. Here are the nontrivial differences between the first and final versions of The Ditmars Tale of Wonders using the English translation by Margaret Hunt (1884). We disregard spelling, punctuation, and grammar updates, and minor shuffling of words. Three fellows who wanted to catch a hare, went on crutches and stilts; one of them was deaf, the second blind, the third dumb, and the fourth could not stir a step. Do you want to know how it was done? First, the blind man saw the hare running across the field, the dumb one called to the lame one, and the lame one seized it by the neck. 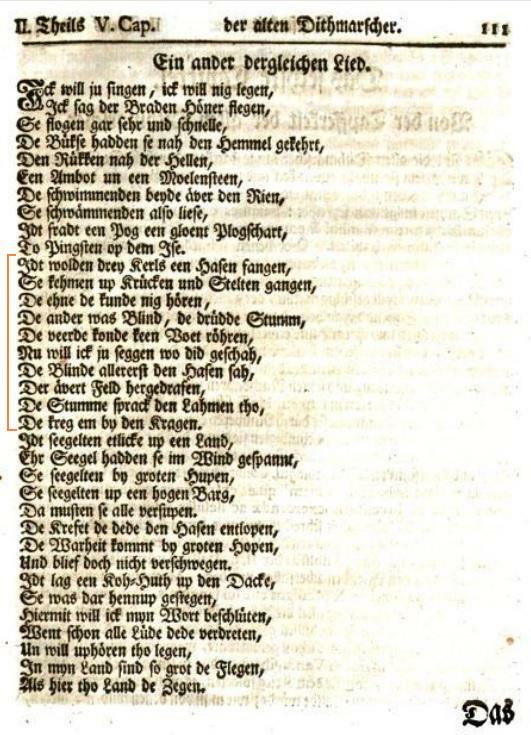 A dancing song, "Von eiteln unmöglischen Dingen", in Anton Viethen's Johann Albert Fabricius's Beschriebung und Geschichte des Landes Dithmarschen (1733). 1: as the goats are here in this country. 7: as the goats are here. 7: Open the window, that the lies may fly out. und der vierte konnte keinen Fuß rühren. 1: groß, als hier zu Land die Ziegen. 7: groß als hier die Ziegen. Mache das Fenster auf, damit die Lügen hinaus fliegen.